Play At Home Mom Giveaway! We wanted to say THANK YOU to our almost 400,000 Facebook Followers. We started this adventure almost 5 years ago and we sincerely appreciate every one of you!. Thank you for being a part of our community. We will be giving away one of our most played with toys! For those of you that have never heard of Stick and Stack they are a “cheaper” version of Magnatiles. The quality is great and we love the versatility of the windows, doors, wheels, fences, etc. They are fully compatible with the MagnaTile Brand. 185 Responses to Play At Home Mom Giveaway! We have so many of the toys from your lists that it’s hard to choose a favorite. We got our daughter Grimm’s rainbow for Christmas last year, and it has been a wonderful toy. She uses it in so many different ways; all the children who come to our house are drawn to it. We don’t have a Zike yet and have been thinking about one for the future. Our favorite is the strider balance bike! Taught my son at 3.5 how to ride a two wheeler! The Zike looks awesome! We are moving to a house with a 300ft driveway soon and I always think how great those would be. I can’t forget citiblocks too! Thanks for the awesome giveaway! In think the favorite toy around here are the magna tiles. We have one set. The kids love it so much that we need more! The marble run is our favorite! We love so many of the toys on your list, but the Construction Letters would be a great addition to our collection since we’re currently working on letter recognition and writing. My daughter would also LOVE the Alex picnic basket! Magnatiles are our favorite toy from the toy list! You can never have too many sets! I have been using your guide for the past 3 years whenever I need to buy gifts! We love them all. Right now, my kids are really into Magformers and I am excited to give them a bunch of Playmobil, cash register and fingerprint book for Christmas this year. I was just thinking how much I want them to have Magna-tiles! Thanks for all you do!!! We love everything you do in my house! You have inspired much play in my house! My favorite toy, are all the books you recommend! My toddler has seriously loved every single one of them and we read them all the time! We are getting a lot of the toys for Christmas, so right now our favorite is the climbing dome. I’m really excited to get the citiblocs, magformers, and magnatiles! I love the magnetic dress up dolls and the magna tiles. My girls love to play dress up and build things. There are so many great toys on this list that my kids love but one we do not have yet is the climbing dome. It is on my want list come summer. We are getting a grimms rainbow for Christmas! So excited!! We just got the Melissa and Doug calendar, and my 3 year old, who needs to know what to expect from his day LOVES it. My kids love the magnatiles! I hope we can add to our collection. My kids are 21 months & the Magnaformers are lots of fun. They are getting wooden puzzles for Christmas. Thanks for the chance to win! My kids love the small set of magnatiles we have. They would LOVE this set to go with it! I recommend them to everyone who asks. Magnatiles for sure! They were the biggest hit when I taught preschool. But we would be just as happy to win these. Our favorite toy from your toy list? That’s almost impossible to answer! If I had to choose it would probably be magnatiles! We play with them almost daily. One we don’t have but would like to get is the climbing dome! The magnetic tiles. I am just amazed by all the new things they make, the possibilities are endless with them! love love love magna tiles! probably the best purchase ever – still gets practically daily use three-four years after we got them! but we also have magformers, kinetic sand, the three-wheeled scooter that I can’t think of the brand listed, and all sorts of other toys either due to or coincidentally on your lists!! I love the light tables!!!! I also love the rainbow arch blocks what fun! The engineering side of me can’t resist the magnatiles. We don’t have them yet but a friend does and we love them! We’ve been saving for magnatiles or stick n stacks for awhile now and I’ve had my eye on snap circuits as well. Thanks for all you do! We love the stack pegs, M&D cutting food, and shopping cart. I’m hoping to add the big bubble mix to stockings this year and would love to have some magnatiles! Magna tiles and grimms rainbow are on our wish list! My kids love playing with magna tiles at our museum. I’m so excited to know there is a cheaper brand that is good quality! All 3 kids love playmobils, even my husband and I love them. My boys love magma tiles. Also love the design and drill set!! We love citiblocs and snap circuits. There are a ton of things here that I’ve been meaning to buy, though. Such a fantastic list of toys. Thank you for making this album and blog. We love your toy lists! Magnatiles have been our favorite so far. We used your instructions to make a light table, which is awesome! We love magnatiles, the letter building things, and looking at slides from my college photography class on it! We also have the ball hopper, scooters, and probably a lot more I can’t think of. You guys also gave me the courage to build an indoor playground for my kids and to hang swings from the basement ceiling! Thank you! My kids love the marble run. Magnaformers are on the list to get the kids for Christmas. Just one? I’ve always loved those rainbow blocks – they’re so pretty! I’m new to this stuff, but I’m going to see say magnatiles, bc I had never heard of them before. We have lots of new stuff on our Christmas and bday lists! My family and I absolutely LOVE the magnatiles! Fun for mom and dad to play and build with the kids… even better… NO BATTERIES/ELECTRONICS/LEANING TOY! we love them! The magnatiles look awesome! We don’t have any but I am pretty sure all 3 of my kids would love these! Definitely Fort Magic. We got it when it was on sale and the kids haven’t stop playing with yet. We love magnatiles (and can’t wait to get the climbing dome for spring and summer). Playmobil is a big hit in our home. The quality and the detail is amazing! My 3 year old loves the books we can sing as we read. Love the board book recommendations and filled our little bookshelf with your book list. Reading is a huge part of our day! She is always asking for me to read Pout Pout fish. Our favorite toy from your list is definitely anything playmobil! The zoo is my son’s favorite! Love them all but the spinner looks awesome! Magnatiles and playmobil are my favorites! And I’ve been eyeing the stick n stack sets on Amazon to buy for Christmas but the price keeps rising so not sure I can buy them yet!! My favorite toy is the magna tiles. My lil is getting a small pack for xmas she loves to build! How can i choose just one?!? We have a few of the toys on the list and they’ll be getting a few for Christmas but they love the h20 la la tablets. And we have a few magformers that they love as well! Until I joined this group, I was at a loss on what fun, educational toys to buy my boys (4 and 1). I have found many great things on the toys list that the boys have loved. Magnatiles were my first purchase about a year ago and they are the most played with toy in my house. Love this group! Stick n stacks magma tiles and magformers. We don’t have any but have played with them at our children’s museum and love em!! Your toy list has been a lifesaver for many birthday and Christmas gifts over the last few years. We are obsessed with Magnatiles! We love our dome and Picasso tiles! These would be an awesome addition! Everything! Have several items, would like the Grimm Rainbow and the climbing dome. Some day! My favorite is Grimm’s Extra Large 12-Piece Rainbow Stacker – Wooden Nesting Puzzle/Creative Building Blocks, but it’s out of stock, and I’m so disappointed! We love your stacking blocks with the translucent/colored centers. We bought them from Discount School Supply last Christmas based on your suggestion. I have so many moms ask me where I got them and I always mention your blog! The little barns with animals look fun! We are going to start leaning numbers and simple math after the holidays and these would be great! We love our mag formers! Our favorite toy from your toy list is the Melissa and Doug Unit Blocks Set! A timeless classic! We love the micro scooters. Hard to pick just one! But it may just be Zingo. We introduced games at around age 2.5 and my daughter & most of her friends have loved it ever since. I like that the game is great for a wide age range, and can be adapted for all the kids to enjoy and understand. Even my 17 month old loves to play with the tiles and stack them in the case. The older kids even came up with the title “Zingomaster” for the person in charge of the dispenser. We have been eyeing the hand bells for a while now. I requested several of the games on your list for my son. I believe Camelot Jr. was one. We love citiblocs! We also have some of these stick n stack sets on our Christmas list. I know they would be a hit! We love all the books! My son loves to read so its nice to see what books others have enjoyed! I would love to get him a set of magnatiles based on everyones positive comments but they seem so expensive id hate to buy them and he not be interested! My boys really like Automoblox! Our kids love their Magnatiles! We have so many other things from your toy list that we love here too! The outdoor climbing dome just arrived and we’ll probably save that for Spring but can’t wait to set it up and see what they do with it! We have the balance bike, Citiblocs, and cash register. This year I went straight to your list and found 4 things to give as ideas to one of the grandmas for our three year old. He’s getting the microphone and mini amp, Lauri pegs and pegboard set, and the Ergobaby doll carrier! I can’t wait! 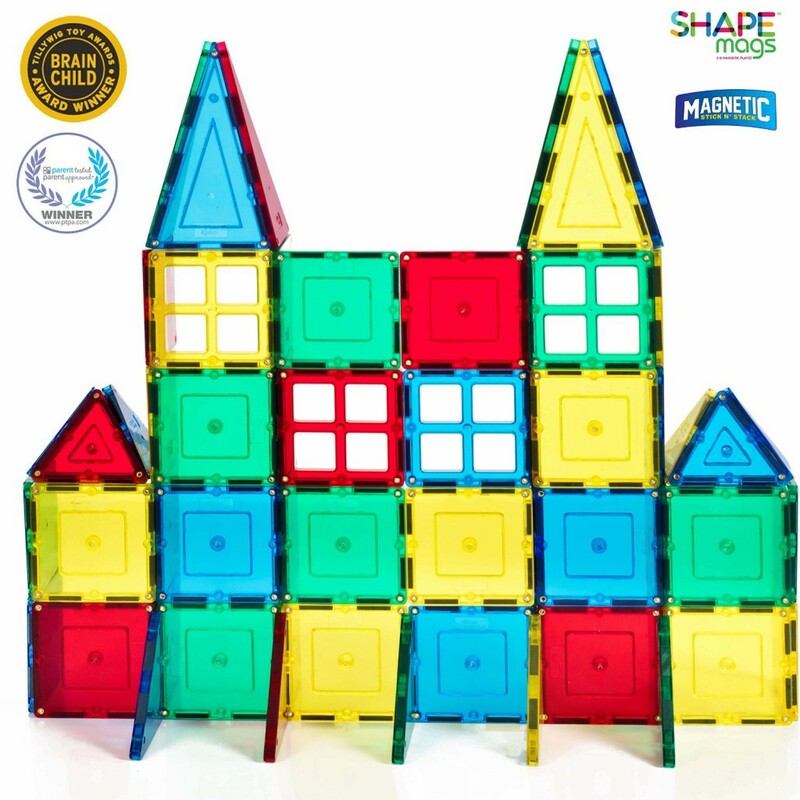 Our all time favorite toy from the toy lists are magnatiles! Definitely megatiles! We need some so bad! My 5 yr old and 3 yr old love to build with the blocks daily and this would be awesome! We love all the toys we’ve gotten from your toy list because they can be played with in a variety of ways. Our favorite would have to be citiblocs! I love the magna tiles! Actually I love all the toys you share! By far, our favorite toy are magnatiles!!! I love PAHM so much! I’ve been following you from the beginning. I have bought so so many toys from your lists, but I think we love the strider bikes the best! We have two! My youngest (2) will probably be getting one soon as well because it doesn’t look like my older two (5 & 6) will be giving theirs up soon! Magformers is our favorite! So glad you posted a few weeks ago of them being on sale! Love watching your blog! We love magnatiles and playmobil of course but we really want to get some “Big arches”! Favirites we are drawn to are stick and stack (or simular) and snap circuits. Thank you for your blog, I wouldn’t have want to miss it! My favorite from the toy list is the climbing dome. PAHM inspired me to put one on our Christmas list this year and it arrived last week! We’re can’t wait to put it together for our 2, 4, and 8 year old kids! We love the magna tiles! And a few others will be under the tree for Christmas this year. Thanks for sharing! I love every one of your recommendations we have bought. The fort building kit is currently under the tree. However, our magnets are probably played with daily. We love the water table! My husband built one for our son this year and we enjoyed many hours with it before it got too cold. The Melissa and Doug food cutting set is a huge hit in our house!! I get so many great ideas from all the wonderful Moms on the PAHM page. I’m really interested in trying Grimm’s rainbow off the toy list for my twin 3 year olds. My son has had the strider bike since he was 2yrs old and, 2 years later, he still loves it! My oldest is getting wooden planks for Christmas and my youngest is getting colored dominoes. We would LOVE to have a set of Magnatiles! I dont have any toys from your toy list that I know of, but I got my son snap circuits for Christmas and I’m sure he will love it. I got my littles unit block for Christmas… can’t wait to open them! Our favorites are the magnatiles and magformers as well! We also built a light table from a train table, inspired by yours, that’s been getting a lot of use recently. This set of magnetic blocks you’re giving away is on my wishlist right now! Oh I LOVE the Butterfly Garden! We tried to help the Monarchs this year by planting tons of milkweek and were able to watch some spin! Was so educational and fun for the whole family! Our favorite toy from your lists is Magnatiles! We love what you do PAHM! Thank you! Or favorite toy is the magna tiles! My girls love to build! Your site is my number one place to look for highly engaging toys for my little girl – no batteries required! I’m hoping to be able to afford some magnatiles soon! We loves magnatiles and minikickscooter. We love Magnatiles! The kids will be getting Sequence for Kids and Catle Logix for Christmas. I know that they will love them too! Thanks for all of the super toy ideas! We ordered the walkie talkies you recommended on the toy list. I know they’ll be a favorite! I love fort magic and magnatiles! We are all about the Legos at our house but would love to try the stick and stacks!!!! I bought a small set of Magnatiles for my son, I think he’ll love them. My favorite toy on your list is the Diggin Box Set Airplanes. I love the simon game! The Grimms rainbow has been played with for years in our house. We love magnatiles it’s one of the few toys that are played with every day and by both my 7 year old and 2 year old. I’ve been drooling over the Guidecraft sand/water-filled blocks since my kids were babies. They look so lovely. The Melissa and Doug wooden puzzles are a big hit in my house! I love the Grimm rainbow stackers! Pretty and open to imaginative play. We love magnaformers, but Grimms rainbow looks awesome! so many to choose from. i love magnatiles and pegs. My daughter has autism and she spends hours playing with magnetic tiles in her special needs class so I think it would be wonderful for her to have some at home to play with! I look at your lists often for inspiration. The Magna-Tiles or off brands are by far our favorite toy, though! Our favorite is the magnatiles. We do not own any but the kids loved them at the children’s museum. I can’t wait to purchase the climbing dome. We love so many of the toys that are on your list though. One that comes out almost daily are the blocks with the glitter and water in them. Marble runs for sure!! My big kids still play with theirs and my little one is now old enough to have fun with it! I’m seriously considering the lap harp for my daughter. She’s commented a couple of times that she’d like to play the big harp. We’ve loved the Live Growing Kits! We’ve had butterflies twice and a tadpole. We love watching them grow and talking about the life cycles. We love a lot of things from your list. The magna tiles for sure. The zeke bike looks awesome too as well as the rainbow. Thank you so much for sharing your ideas! You are a great inspiration! I love the big arches or the Grimm’s rainbow sets. Those are on my wish list for sure! Our favorite toy is the magnatiles. It is the ONE thing all 5 of my kids can and will play with…from ages 1 to 9! Even hubby loves them! It was a big hit in our family three years ago and they still play with it! They are all great. Manga tiles are one of the consistently played with toy at our house! We love our magna tiles and I have wanted to get my son the rainbow sand blocks for forever! It is soooo hard to choose just one because this is a great list, but I think I’ll go with the bubble machine, the peg board and stacker, and finally the dome climber. All of these have so many different purposes and fun ways to teach multiple skill sets! We love Magnatiles and Citiblocs at our local children’s museum. All these toys are wonderful though! We just got the lifetime some and LOVE it. We’ve also made a climbing wall and light table for our kids for Christmas. These stick-n-stacks would be perfect for the kids’ light table!!! We have many of the toys you’ve suggested over the years. Our favorites are the stacker pegs, micro scooter & Melissa & Doug barn. These toys are played with frequently and are always accessible! Merry Christmas and thanks for the chance to win. We are in love with Magna tile!! It is such a genius thing! Your posts have been so helping for me. Thank you so much. And happy holydays! i love the rainbow stackers! I love all the toys your post. Unfortunately were not in a position where we are able to buy our kids hardley any new toys in a while, but when that changes the stick and stack is definitely a first. Along with a light table and many of your light table toys. Thank you for the opportunity to win this awesome toy! Our favorite toys from your list are magnatiles and citiblocs! They are played with daily. Thanks for all your hardwork and this giveaway. My son loves the wooden tunnels/arches and the jumbo animals from Learning Resources! He uses both in all kinds of imaginative play. I’d love to get the Grimm’s rainbows and magnetic tiles some day! Tall Sticker pegs building kit!